Its recent major facelift only makes the Israel Museum even more of a must-see. The museum reopened in the summer of 2010 after long months of renovations, featuring many new galleries and public spaces as well as a completely revamped design to many of its wings. One of the major highlights of the museum—and one of the city’s more recognizable landmarks—is the distinctly shaped Shrine of the Book, which houses many ancient manuscripts including the Dead Sea Scrolls. Nearby, lending historical context to some of these priceless manuscripts, is a definitive grand model of the Second Temple and surrounding Jerusalem neighborhoods circa 2000 years ago. Other highlights include the Youth Wing, providing children and the young-at-heart with fascinating exhibitions and programming, and the Billy Rose Art Garden, which showcases the development of western sculpture over the centuries and features works by many top masters including Auguste Rodin, Claes Oldenburg and Jacques Lipchitz. The museum’s Fine Arts Wing displays works from all over the world and does justice to the museum’s eclectic, interdisciplinary approach. Like other sections of the museum, the Fine Arts Wing has recently been reorganized into various categories such as Modern Art, Israeli Art, European Art, and Contemporary Art. The installations are organized in such a way as to emphasize shared themes and facilitate an inter-textual dialogue between similar images. A new 2,200-square-meter gallery floor is devoted to changing displays of contemporary art. In the Archaeology Wing, visitors can take stock of the many cultures which called the Land of Israel home over the centuries. The objects are organized chronologically, through seven different “chapters” beginning with prehistoric finds. 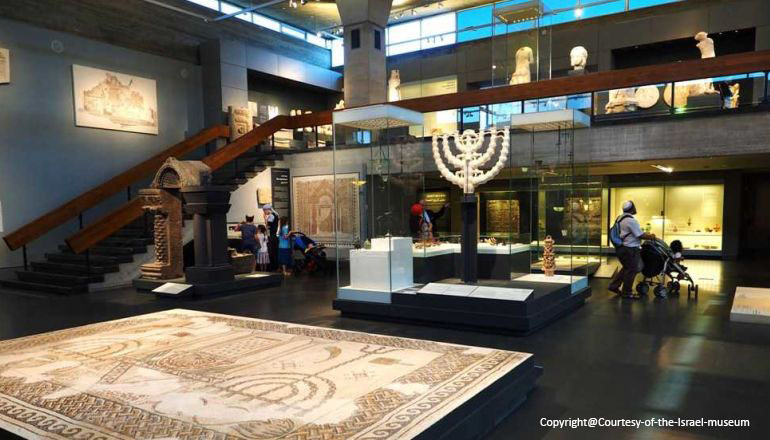 For one of the richest cultural experiences Israel has to offer, make sure to devote at least a day to the Israel Museum, and in addition to the exhibitions, check out our Events for Israel Museum happenings such as wine and kite festivals.